Technical and commercial consultant,Manufacturer of turnkey plastic waste recycling plants, system handles plastic waste from industrial, agricultural and urban origin generally without any particular sorting nor washing, manufacturer of machines and automatic plants for the production of cement-aggregated tiles and steps with granulates and powder of marble, granite, quartz and others. Site includes photos and technical specifications. you need Java Virtual Machine for correct viewing - download and install it now! The photos are showing a sight of the nice Dubai Creek view and on the left the majestic Al Burji Hotel in Jumeira beach site, which is elevating its top level up to 321 meters on the sea level. 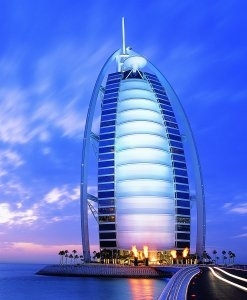 These modern architectonics buildings which are getting Dubai filled of an extraordinary beauty, are indicating the high willing of the rulers who had given and are continuously giving to the city the best of the best. I wish to extern my gratitude to their Highness Mohammed Bin Rashed Al Maktum and Al Maktum Bin Rashed Al Maktum to have given to me the possibility to live this extraordinary virtue of beauty on these years of my residence on this so magnify country, which counts me as its citizen since the year 1992. My profession is carried out around the huge Ocean of the Art of to Sale, and according to that in a good commercial consultancy. On top of this, my good knowledge and experience on the plants as reported on this web, is elevating me at a good technical consultancy toward the single machine up to the fully automatic configuration plants able to producing finished products as: Flooring and cladding tiles - cement building material products - waste plastic recycling. My trading ability has allowed me to reaching the introduction trough the main world markets, and to win a high level and constant clients, which are having continual skilled progressing necessity. My scope is the one to extend further on new useful contacts to the industrial companies strongly interested on their production expansion either on same technology plants as on this web published, or to all those companies in other activities that wishes to expand their sales abroad. Exploring this web pages, you’ll get introduced also by the utility supported by photos, video clips, to those machines and large automatic plants, that trough my high profession were successfully before proposed to be then sold to those faithful customers worldwide spread. These video supports will surely helping you on giving the right evaluation to whom could be interested on this my activity; also to those companies in different fields that would be interested on catching this opportunity to be supported by me on all those foreigner markets as listed on this web.